In a medium saucepan, cook the quinoa according to the package directions. 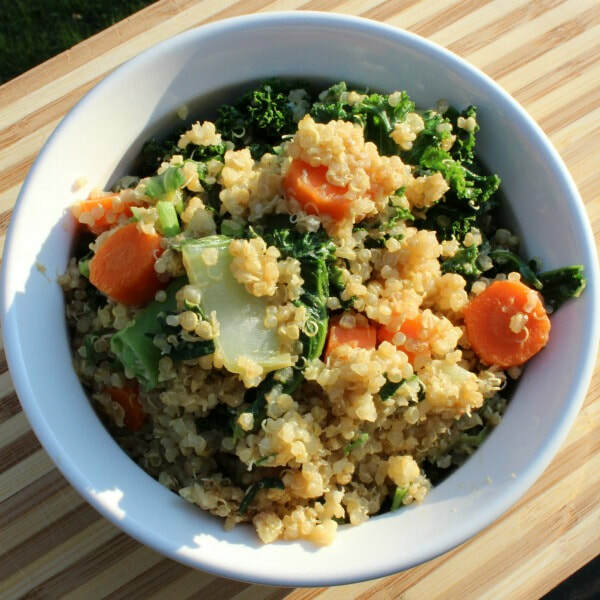 Once the quinoa is done, place it into the refrigerator to cool to room temperature. While the quinoa is cooling, in a large sauté pan or wok over moderately high heat, warm the oil. Add the ginger and garlic and sauté, stirring, for 1 minute. Add the carrots, snow peas, bok choy, kale, and chives and continue cooking, stirring occasionally, until tender, about 5 minutes. Add the cooked quinoa and stir to combine. Add the eggs and continue to cook, stirring, until scrambled, about 3 minutes. Add the soy sauce and continue to cook, stirring, for 1 minute. Serve hot.